Because perfect lawns feed no one. And because I haven't had the nerve to suggest to anyone wielding a weed digger that perhaps the dandelions could stay. So I'll let the bee look them in the face and stare them down. Oh, this is great! I've been working hard to make my property bee-friendly, and I hope the bees don't mind that they have lavender, yarrow, and hummingbird mint to feast on -- but no dandelions! Thank you for the public service announcement! I'm sure the bees appreciate all the flowers you are cultivating on your property! 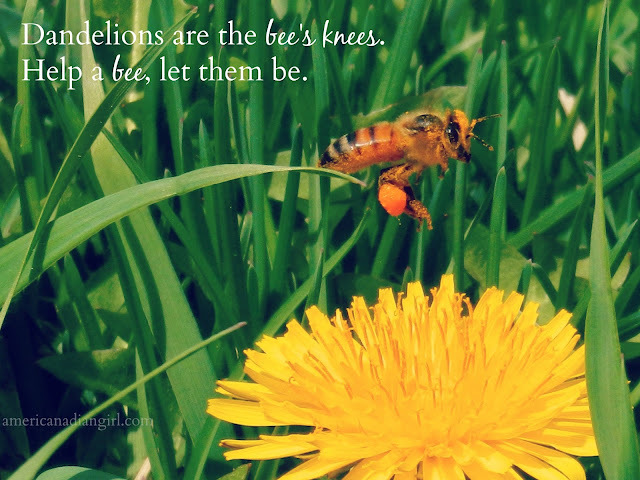 And we enjoy watching the bees do the work they were created to do, there is so much to learn from them. Thanks for stopping by, Gretchenjoanna.